A long long time ago in a state not so far away (from me at least). I was living in a town called Sterling. This town didn’t have many people living in. When I was growing up, it was definitely under 15,000 people. It was one of those “everyone know your face and your business” kinds of towns. There wasn’t a lot to do in my hometown. You could sneak alcohol from your parents and meet up at the park with your friends, or you could invite friends over to hang out and play video games at your house. I’m thinking you can guess which one I did, mostly. My dad introduced us to Star Wars at a pretty young age. I’m pretty sure we wore out the tape on a few Original Trilogy VHS box sets. I loved Star Wars. Growing up in a small farming community and realizing you don’t want to be a farmer, can make you feel stuck. As I grew older I felt myself identifying more and more with Luke. I wanted something more than the life I had and Star Wars was my escape for many years. I’d play games like Knights of the Old Republic, Episode I Racer, Super Star Wars, and other games just to feel an actual sense of belonging. I would check out books from the expanded universe from my middle school library and rack up late fees because I would try to hide how much I really loved Star Wars. When I became a parent, one question started rolling through my mind. When is the right age to share my love of Star Wars? I wanted J to be old enough to understand some of the dialogue while being old enough to ask questions. How would I introduce him to Star Wars? I thought the easiest way would be to listen to the soundtrack over and over again. So, after I became an at-home dad, I would turn on the soundtrack while I was doing the dishes or the laundry. Then, I started buying the Jefferey Brown “Darth Vader and Son” books, waiting for the day that J would know the characters and want to know more about the stories. When it was announced that Disney was purchasing Lucasfilm, my heart jumped for joy. I remember thinking to myself, “my dad was able to see the original trilogy in theaters, I got to see the prequels in theaters and now J gets to experience the same feeling we had all those years before.” I decided that J needed to see the Original Trilogy before we went to see The Force Awakens. He was 4, and I was surprised by how much he sat through in his first screening. He recognized every song that we had been listening to for years. His eyes lit up with the first ignition of a lightsaber and he’s never looked back. Then came Rebels. A show that we could start together and finish together. We watched every episode we could together. Sometimes I watched ahead because I can admit that I have little self control when it comes to watching my stories. Rebels was a show that we could talk about and (even though he youngling) have meaningful conversations about. We talked about light, dark, and balance. It’s amazing to think that so many wonderful memories that I will have for the rest of my life with my son revolve around Rebels. At this point you are probably bored out of your mind at my babbling, so we will move on to Rogue One. I have a rule about making costumes for J. He has to ask me to make them. I will not force a character’s look on him. Rogue One was a movie that I wanted to see before taking J, I wanted to see if it would be “okay” for someone of his age. During the credits I leaned over to my wife and said, “I hope he asks for a Cassian cosplay!” She agreed. After watching Rogue One, my wife and I agreed that the movie was no more violent than anything else in the Star Wars universe, so I immediately purchased tickets for J and myself. When J and I were in our screening, he leaned over and said, “daddy, can you make me a Cassian cosplay?” Immediately my heart began racing at the thought of how adorable J would be as Cassian. I never thought it would take the internet by storm. Because of that costume, he was on the Reddit front page, he had an article written about him on starwars.com, and he’s had the chance to meet a few actors from various Star Wars films. Now onto the conclusion of this piece. If you’ve hung on this long, you deserve a solid answer. Why Star Wars? Star Wars is a connection. It connects 3 generations of fans all over the globe and I am lucky to be apart of that statistic. Some of my fondest memories and friendships have happened because of Star Wars, and I will never be able to thank George Lucas, Kathleen Kennedy, the actors, the writers, the directors, the production teams, and everyone else who has ever been involved with Star Wars enough for all the memories that you have helped create for my family with the stories you tell. J’s class has been learning a lot about fairytales and fractured fairytales. During their Writers Workshop time, the kids would write about the heroes and villains they would like to have in their own fairytales. The kids then had the assignment to write a fairytale. Below is The fairytale that J wrote (with a little editing by me). We hope you enjoy it. Once upon a time in a galaxy far, far away, there lived two apprentices. The first one was named J. The second one was named Antony. They loved to do really, really cool things like fighting bad guys. One day they found a portal leading to the Marvel dimension. They got pulled in by a giant scrap robot. The giant scrap robot was controlled by a bad guy called Ultron. They found some super heroes called The Avengers. They only found three Avengers. One was named Iron Man. The second one was named Hulk. The third one was named Captain America. They all were struggling. Then, right there in the sky, they found an Imperial Space Station called the Death Star. The Death Star was trying to invade and destroy the Earth. They found a squadron of X-Wings. The X-Wings were called there by the apprentices. Then, out of nowhere, they found some U-Wings. On Earth, they were calling out a lot of the ships. They found another bad guy that was named Loki. Loki was helping the Death Star. They saw another portal, and Loki pulled them out of the portal. Then they saw a guy named Firestorm coming out of the portal. Out of nowhere, a guy on a motorcycle named Ghost Rider with a flaming skull and chain came to help Firestorm defeat Loki. Out of nowhere, a U-Wing picked them up so they could fly to the Death Star. The U-Wing dropped them off at the tractor beam so they could be sucked into the Death Star. Then, out of nowhere, Darth Vader came. He was a Sith Master. His lightsaber’s color was red. The apprentices charged at him. Then Vader cut Antony’s arm off. A hero name Doctor Strange came and reversed Antony’s arm injury with a weapon called the Eye of Agamotto. The Eye of Agamotto had a weird item called an Infinity Stone. There are six Infinity Stones. The one that is in the Eye of Agamotto is called the Time Stone. A second one, which is in a hero named Vision’s head, is called the Mind Stone. Doctor Strange used one of his awesome powers and shot Vader in the face. Then, a bad guy named Thanos destroyed the Eye of Agamotto by smashing it. He flew down to Earth, shooting everyone with time lasers, turning everyone into babies. They ran into a bad guy named Joker. Joker had a weird flower on the side of his chest and it shot pollen. He had a purple jacket, a white striped shirt that was green, and grey boots. His pants were purple. Joker was immediately beaten. And they lived very happy lives. Full disclosure, I didn’t edit much. I added a few words that he missed here and there. The biggest edit was wherever you see “out of nowhere”, J had originally written “out of the open”. As I said before, we hope you enjoyed J’s little story. Maybe I can convince him to write a new one of these once a month. In this week’s episode of The News with J, J talks about Dr. Seuss, what comic books are coming out next week, Star Wars Rebels, Marvel Studio news, and Wreck-It-Ralph 2. Let us know what you think of our new show in the comments!! Out of all the amazing things that J and I have been able to do over these few years, going to Star Wars Celebration wasn’t even on the list of probable things at least until J was a bit older. Last year, we watched Celebration from the comfort of our home just waiting for the day that we would be able to be amongst the crowd. This last weekend however, J and I boarded a plane to our very first of hopefully many Star Wars Celebrations. We left Salt Lake City at 2:30pm on Wednesday April 12 and landed in Orlando at 1:30am on Thursday, we had a 3 hour layover in Las Vegas, we went to sleep around 2am and woke up around 5:30am for our first day. Even though Star Wars Celebration didn’t really begin until Thursday morning, it kicked off for J in Vegas as he was recognized by quite a few people in Vegas and that continued into Thursday as we were walking the line that wrapped around the Orange County Convention Center. When we found out that we would be attending Star Wars Celebration 2017, I initially got nervous. I get really nervous around large groups of people and I was worried that my nerves wouldn’t allow me to have a great time. Usually if I feel overwhelmed at Salt Lake Comic Con, I can either step in a quiet room or I am just a 5 minute train ride from home. But this seemed like an opportunity that I couldn’t pass up and especially with J. I am really happy we made the trip, we had a blast on the exhibit floor and in the panel rooms. Star Wars Celebration, like many conventions around the world, had some kinks in the chain. That is expected and forgivable, and without those kinks, some of our favorite moments wouldn’t have happened. We, along with Dr. Sarah from Geek Parenting Podcast, arrived at the Orange County Convention Center around 9 am on that first day. The line was already starting to wrap around the convention center. As mentioned before, J was getting recognized by people in line and I could hear people asking their friends if it would be weird to ask for a picture with him. Before we move on, I want to say that, no it is not weird. Just ask, he is usually more than happy to take pictures with people. We stood in line behind some fun people and we talked with them for about an hour before we saw someone we recognized in line. We told him to hop in line with us and talked with him for another 30 minutes before we made it into the convention center. Once we hit the exhibit hall, our minds were blown. 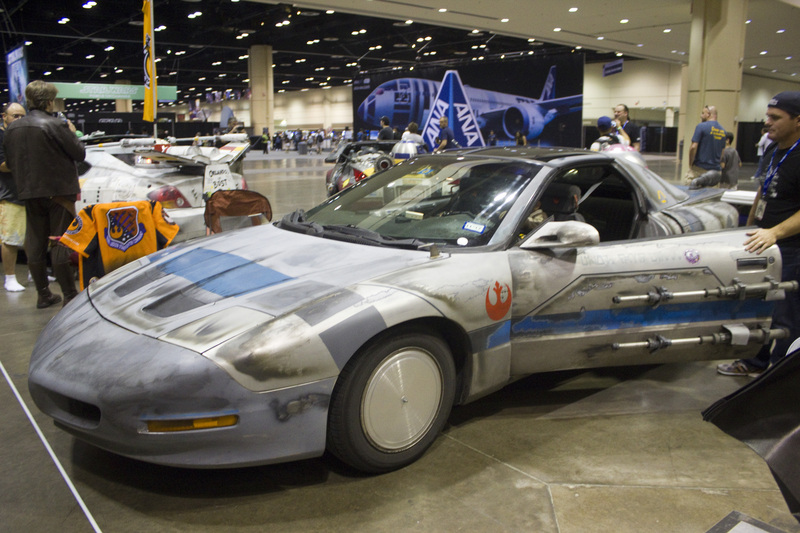 A snowspeeder greeted guests to the wonders of Star Wars Celebration. As we ventured further into the hall, we saw these amazing cars that were modified to resemble ships from the Star Wars universe. 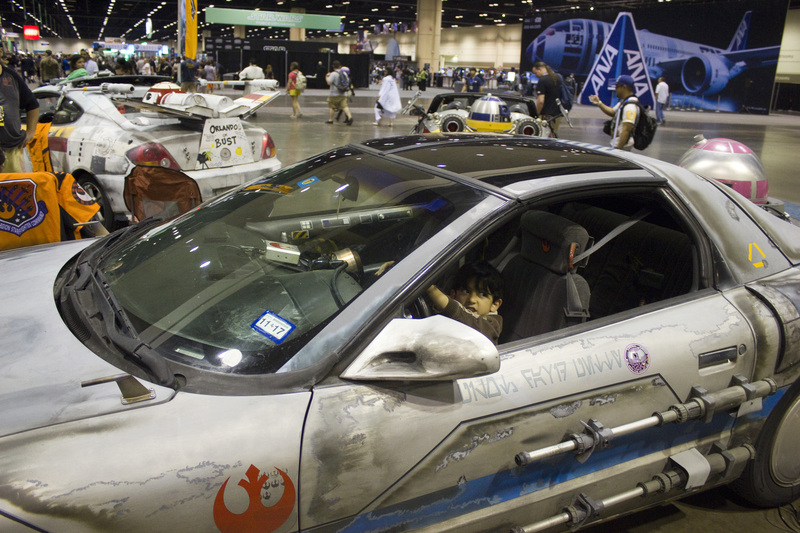 When we were approaching these cars, J noticed that one looked especially familiar and from about 30 – 40 yards out he ran screaming “POE’S X-WING”. The owner of the car peeked his head out looking for the excited fan and he greeted us at the amazingly modified vehicle. The owner asked me how old J was and I responded. He was in shock that a fan so young would recognize which X-Wing when all of the older fans just thought it was some “random X-Wing”. He told us that J “made his con” on the first day and that he was so appreciative of how much J loved his car. We didn’t make it into any of the big panels, mainly because I like sleeping in a nice comfy bed and a nice shower to wake me up in the morning, but we were able to watch them from “The Star Wars Show” stage or on my phone. While the panels were going on though, we took advantage of the little to no lines at all the vendors’ booths to see what goodies we could bring home from our adventure. There were quite a few big name vendors on the floor at Celebration. 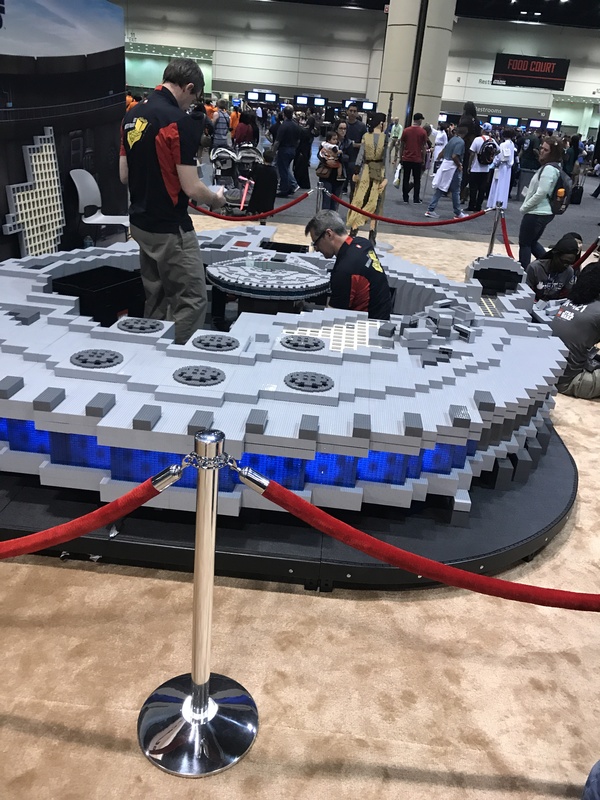 LEGO, Hasbro, Walt Disney World, Nissan, Funko, UNICEF, and others had interactive booths that fans of all ages would enjoy. LEGO set up building stations for kids to help the Master Builders build an enormous LEGO Millennium Falcon, Hasbro was showing off their new “Forces of Destiny” toys, Walt Disney World brought Jedi Training to Celebration, Nissan had their Nissan Rogue present with the VR experience, Funko had some exclusive POPs, but our favorite booth had to be the UNICEF Kid Power booth. Not only did they have special edition 40th Anniversary “Force for Change” Kid Power Bands, but they had the one and only Ashely Eckstein (Ahsoka Tano) at the booth doing some Star Wars themed exercises with the kids. There was so much going on panel wise that I would need at least 20 of me to experience everything Star Wars Celebration had to offer. They had the “Celebration Stage” where all the main panels took place, the “Galaxy Stage”, “Fan Stage”, and “Behind-the-Scenes Stage” all had their own panels as well as streams of the bigger panels. There was a “Family Stage” where activities for the younglings took place. Kids could do “Padawan Training” along side the Saber Guild of New York, they could draw with artists, and had little cosplay contests every afternoon. Across from the “Family Stage” was the “Rebel Theater” where they were showing episodes of Star Wars Rebels every day from open to close. There was also a “Podcast Stage” where Star Wars themed podcasts met with fans to record a “Live from Celebration” episode. We stopped by to watch our friends from the Full of Sith Podcast record their episode. If you have some time, you should go check out their Celebration episode. Every day at Star Wars Celebration was packed with so many amazing activities and I am glad we got to experience as much as we did. Now that we got the formalities out of the way, let’s go into some of the big things that happened at Celebration. If you watched the 40th anniversary panel, you saw the return of Hayden Christensen to Star Wars Celebration, and that George Lucas and Harrison Ford made an appearance on stage. What you didn’t see was the reaction on the exhibit floor. As I mentioned earlier, we on the exhibit floor had the ability to watch the big panels courtesy of The Star Wars Show’s giant screen, so we were able to see everything happening in real time as well. We were right next to the stage screen when George Lucas was announced, and I have never seen an area get so cramped so fast. People ran from all corners of the floor just to catch a glimpse of the man who created this wonderfully vast universe on the big screen. Tears were streaming down fans faces around the entire convention center as John Williams took to the stage to play Leia’s Theme at the end of the 40th anniversary panel. We caught a glimpse of The Last Jedi during The Last Jedi panel and it was as glorious as I was wanting it to be. It filled me with hope and excitement and I’ve watched it at least 30 times since it was released. I want to discuss the trailer in more detail, but that could be it’s own post and maybe even a future episode of Geek Parenting Podcast. The one thing I will say right now, is that I am excited to see what Luke’s statement at the end of the trailer means for the future of the franchise. Another exciting thing we got to be a part of was the Star Wars Rebels press conference. Dr. Sarah was chosen from Geek Parenting Podcast to catch a sneak peek at the fourth and final season of Rebels, while J and I watched the panel from outside of the room on my phone. Since we were not in the panel room, J and I were able to get some good seats for the press conference for the three of us. One of my favorite things about the press conference, that others may find annoying, was Dave Filoni’s ability to troll the members of the press. Almost every question was met with misdirection and I was loving it. 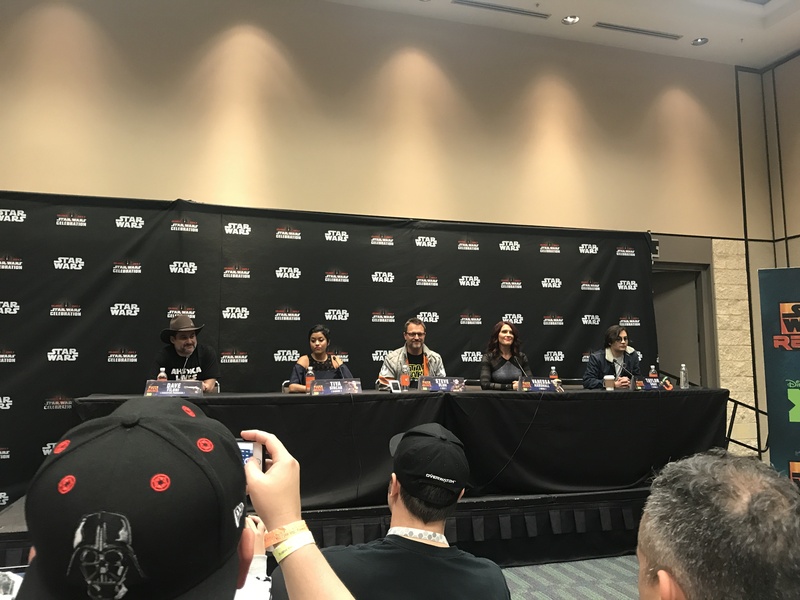 Press members would address questions to the voice actors and they would all look to Filoni for what they could say, which was usually “not much”. After the press conference, J got to meet and get a picture with Taylor Gray (the voice of Ezra Bridger) and we got to catch up with Salt Lake Comic Con alumnus Steve Blum. The rest of our Celebration weekend was spent meeting friends we’ve made through social media and getting pictures with cosplayers from around the world. It was amazing finally meeting and hanging out with people that we’ve known via Instagram/Twitter/Facebook for a year or more. Every single one of those friends have been very supportive of the blog and social media accounts, and they all made J feel like a celebrity. 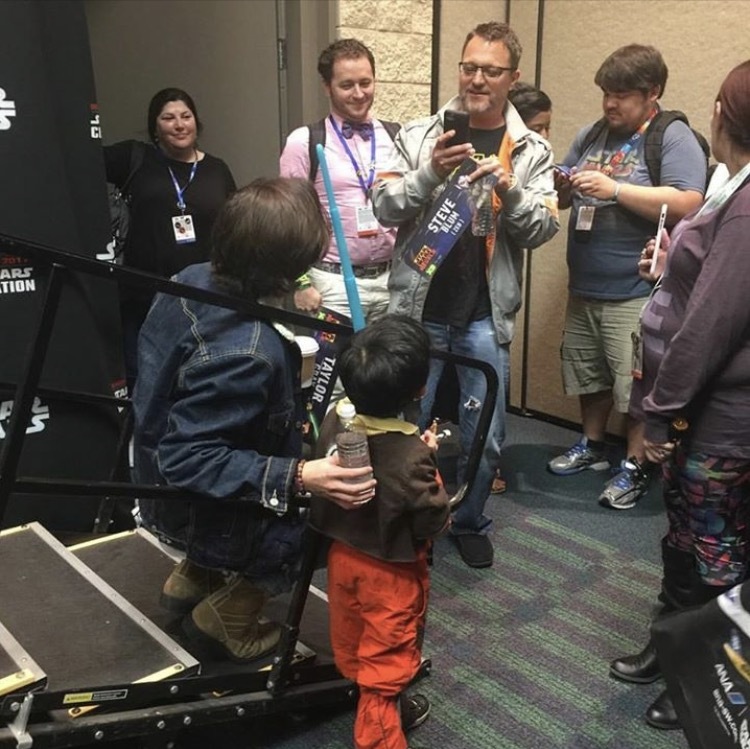 They all helped make Star Wars Celebration 2017 one of the best memories he will have for the rest of his life, and I want to thank everyone who made it possible for us to be there. If you read my posts, if you follow us on social media, if you donated to the GoFundMe that Dr. Sarah started, you hold a special place in our hearts. Thank you all for your love and support, and we hope that we can keep putting a smile on your face with our posts. You can see some of our photos from Star Wars Celebration by following us on Instagram. By now, I’m pretty sure that most people who have found their way to our blog have watched Rogue One. If not, you may want to stop reading this post until you’ve watched it. I’ll wait. Have you started watching it yet? It was pretty great, right? Well, everyone has a right to their own opinion. As most of you probably know or guessed we loved Rogue One. We’ve seen it quite a few times, and yes it still is as emotionally charged as the first time we saw it. The characters were amazing, the writing was fantastic, the cinematography was spot on, the directing was great, and the actors were spot on. Before we continue, this is not another review of Rogue One, this is a deeper look into what one line of the movie means for Star Wars fans of all ages. During a heated conversation between Cassian Andor (Diego Luna) and Jyn Erso (Felicity Jones), Cassian says, “I’ve been in this fight since I was six years old.” In this day and age, a statement like this is both exciting and terrifying. Terrifying in the sense that child soldiers are a reality, yet exciting for younger fans who may feel like they are too small to make a difference. As a youngling, I remember wishing I could be like Luke Skywalker. Fighting the evils of the Empire in my X-Wing along side all my rebellious friends, all the while thinking, “how can I make a difference?” This feeling followed me throughout my youth. If I didn’t like the way someone was being treated on the playground, I would feel the courage starting to build and yet that one thought would creep it’s ugly head and I would end up shirking back into my shell. Star Wars taught me to be courageous, but how could I be courageous at a young age? When J started going to school, I worried that he would end up like me and that he would be a victim of bullies and would sit back while others were bullied around him all because that one thought would find it’s way into his mind. When J found himself a victim of a school yard bully, he turned to his favorite comic book dealing with school yard bullying, “Avengers: No More Bullying”. 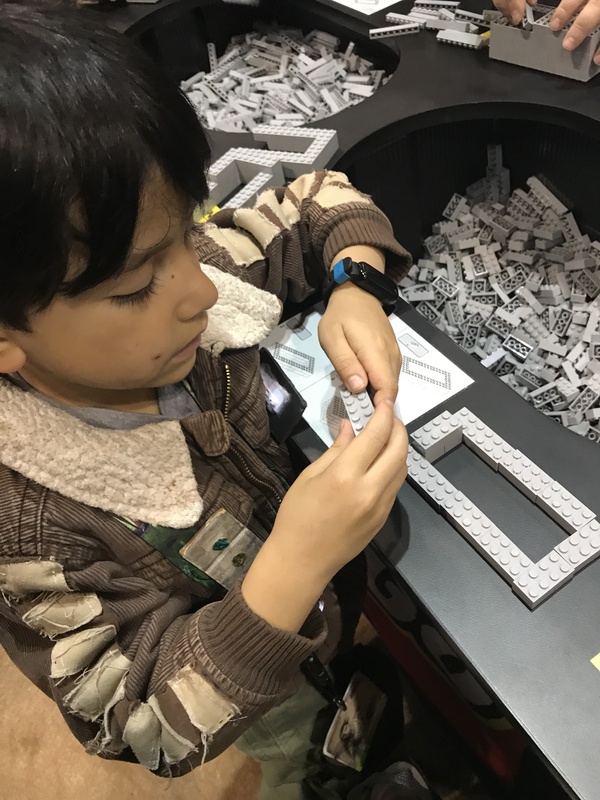 He found comfort in the words written between those pages and found courage in the story of Captain America, Luke Skywalker, and Ezra Bridger. All characters in favorites comics, movies, and cartoons that were courageous in their youth. While Ezra showed courage at such a young age, it was still quite a few years ahead of J and I was worried that he might let that fact stop him from reaching into his courage when he really needed it. I know what you are thinking, what about all the younglings who became Jedi? Yes, younglings show great courage, but they also can rely on the force to aid their courage and while that is great, I think something closer to the realm of reality can have a bigger impact. Before you say, “but Ezra is a Jedi! !”, you have to remember that we first see Ezra before he discovers that he is Force sensitive. Cassian is just a regular human from the planet Fest. He has no Force sensitivity and no cybernetics to enhance his person, so when he says those eleven words, he fills those younger fans with hope. A hope that they too can make a difference and be courageous too. Who were some characters that you pulled inspiration from as a kid? Which characters do you pull inspiration from these days?